You can't please everybody all the time, and if there's a company who knows this better than the rest, it's BlackBerry. At the showy launch for BlackBerry 10, the company finally unveiled its new stable of smartphones with which it would fight the likes of Apple, Samsung, HTC, Microsoft, Nokia and Google. 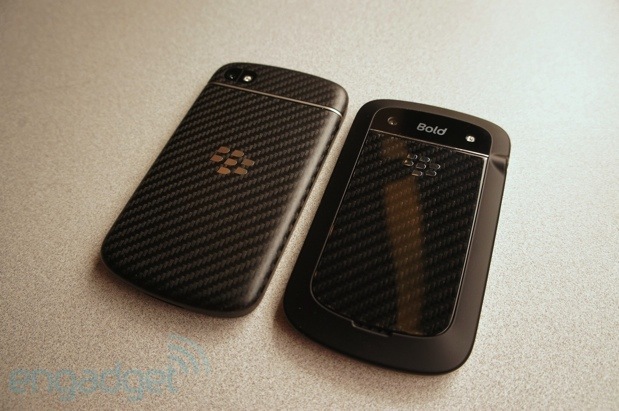 No simple task, that, and so BlackBerry rolled out not one, but two weapons: the all-touch Z10 and the portrait-QWERTY Q10. But there was a catch: only one would launch at a time. It was a staged attack, with the Z10 forming the initial volley. Many said this was a mistake, and that the Q10 and its familiar physical keyboard should have gone first, paving the way for the more radical, all-touch Z10. After what seems like an eternity, the $249 BlackBerry Q10 is finally ready for duty, so let's put it through its paces and see which of these fraternal twins is truly the flagship. The BlackBerry Q10 delivers the great QWERTY feel that fans have been waiting for, but those looking to consume content will want to stick to the larger panel on the Z10. How would you rate the Q10? 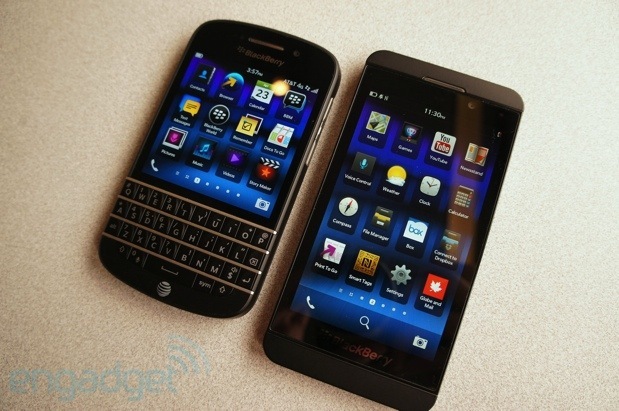 As a portrait-QWERTY smartphone, the Q10 is a bit of a rare bird these days. In many ways its closest sibling is actually a phone with a few years of seniority on it, the Bold 9900, a piece of hardware we quite liked despite its aged operating system. That said, the Q10 shares plenty of design language with the keyboard-free Z10. Its 119.6 x 66.8mm dimensions actually slot in somewhere between those two. The Q10's 10.35mm thickness is one full millimeter thicker than the Z10 that came before and just fractionally thinner than the 9900. You'd never know it, though. Thanks to the Bold's tapered edges, the older phone actually feels considerably thinner. Both have custom glass-weave back panels, but where the Bold's is just an inset in the center, the Q10's is a full backplate that pops off by sliding downward, exposing a 2,100mAh battery, micro-SIM and microSD expansion. 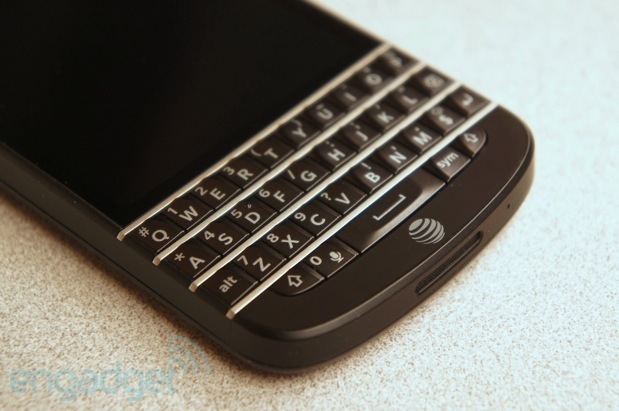 (Note that the white version of the Q10 will feature a rubberized backing, much like the Z10.) It looks quite nice and a soft-touch coating means it isn't likely to slip out of your hand. Plus its composition won't interfere with any of the internal radios, keeping precious signal strength strong. Still, its flat shape doesn't fit the hand anywhere near as nicely as the tapered one on the 9900. A metal band partway down from the top-rear visually divides the removable battery cover from the rest of the back, which surrounds the 8-megapixel camera and its LED flash -- a near-identical setup to that on the Z10. That sliver of metal protrudes ever so slightly, ostensibly to keep the camera elevated from the table when it's lying on its back, and terminates on the sides of the phone, formed by a black rim. We're somewhat more drawn to the look of the brushed, stainless-steel rim used on the Bold 9900 than the monotone darkness found in the Q10. Under here, we're told, is the same metal construction as was used on the 9900, but we have to say we're somewhat more drawn to the look of the brushed, stainless-steel rim used on the elder phone than the monotone darkness found in the Q10. It's very much in line with the Z10 and indeed the PlayBook before, which is to say it's stoic and understated. Looking professional whilst using this phone will certainly not be a problem. Getting your friends and co-workers excited about how the thing looks, however, could be. The only visual highlights on the front are another four unpainted stainless bands that separate the rows of keys. These four frets provide plenty of separation for quick touch-typing and are actually a structural element of the chassis now, adding extra rigidity to the mix. Indeed, this phone passes the twist test with flying colors, not flexing or creaking when some torque is applied. Situated just above the keyboard is a 3.1-inch, 720 x 720 Super AMOLED display. Yes, it's square, which makes watching 16:9 video content a bit of a bother, but it works well in nearly all other regards. In fact, the biggest problem isn't with the display; it's with its placement. The thing is set so far down close to the keyboard that it's actually somewhat difficult to execute the key gesture in BlackBerry 10: swiping up from the bottom bezel. This is the gesture that exits you from your current app and allows you to peek into the Hub. We constantly found ourselves having to swipe up a second time to successfully get home. Those with small thumbs may have less of a problem, and if you train yourself to actually start your swipe on the keyboard and drag up from there, you'll have more success, but we can't help but wish BlackBerry had shifted the entire display assembly up a quarter-inch or so. There appears to be plenty of room between the top of the display and the earpiece, taken up only by a bit of branding at this point. Speaking of branding, it's typically minimal here. There's a metal BlackBerry logo inset on the battery cover, which looks quite polished, and an unfortunate silkscreened AT&T globe logo down beneath the spacebar that looks a bit wedged in there. 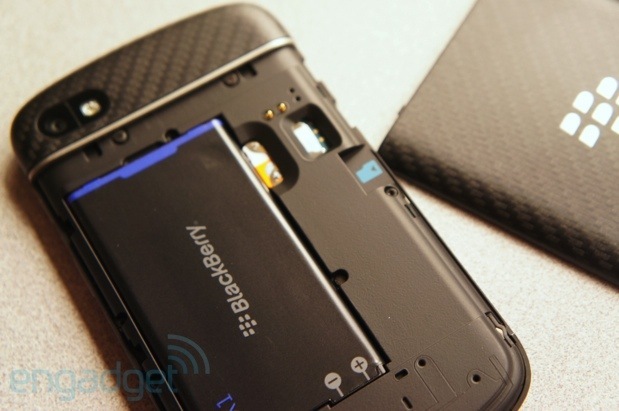 Situated above the display, and above the BlackBerry branding, are the earpiece, 2-megapixel front-facing camera and a notification LED. Up on top of the device you'll find a power / lock button, 3.5mm headphone jack and a pair of microphones for noise cancellation. Moving to the right side is BlackBerry's excellent three-way volume rocker, with a middle button for play / pause and also for quickly toggling vibration mode. On the bottom, you'll find the primary microphone and the device's speaker -- which, we're happy to report, seems to be quite a bit louder than that on the Z10. Finally, on the left are the micro-USB and micro-HDMI connectors. 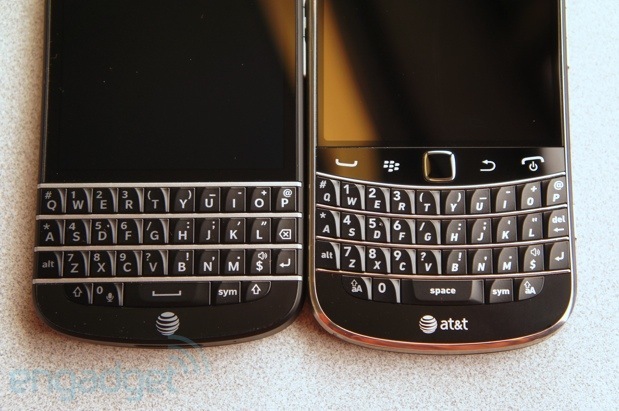 They're positioned farther up the side than on the Z10, where they sit close to the center, but they are at least the same distance apart, meaning, in theory, a dock built for the Z10 could also work with the Q10. Like with the Z10, BlackBerry will offer four SKUs of the Q10, three with LTE (two with HSPA+ and one with CDMA) plus a fourth, non-LTE HSPA+ model. The AT&T version we tested offered quad-band LTE at 2, 4, 5, 17 (700 / 850 / 1700 / 1900) plus penta-band HSPA+ I, II, IV, V, VI (800 / 850 / 1700 / 1900 / 2100) and quad-band EDGE. A second LTE model adds in Verizon-friendly CDMA, with LTE band 13 (700), dual-band CDMA (800 / 1900), dual-band HSPA+ I, VIII (900 / 2100) and quad-band EDGE. The third LTE model offers quad-band LTE at 3, 7, 8, 20 (800 / 900 / 1800 / 2600), quad-band HSPA+ at I, V, VI, VIII (800 / 850 / 900 / 2100) and quad-band EDGE. Finally, there's the penta-band HSPA+ model at I, II, V, VI, VIII (800 / 850 / 900 / 1900 / 2100) with quad-band EDGE. All offer 802.11a/b/g/n connectivity and Bluetooth 4.0. Those who like to move it, move it will find an accelerometer, gyro, magnetometer and GPS. Now, while you can draw your conclusions about what carriers the phone will be arriving on, unfortunately we don't have any confirmations as we write this review. 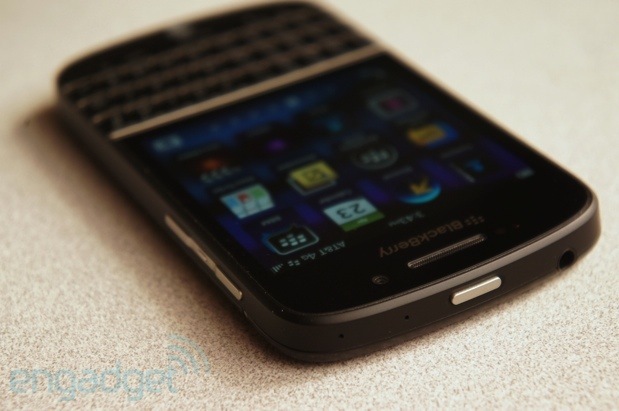 We also don't have a formal release date, but BlackBerry promises it'll be in American stores by the end of May. Canadian readers, meanwhile, can get theirs on May 1st, while European readers should have it before the end of the month. Powering the device is the same 1.5GHz Qualcomm MSM8960 dual-core CPU with 2GB of RAM. The phone also offers 16GB of internal storage, with microSD expansion on tap. Call quality was on-par with the Z10, so about average, but again we're happy to report the built-in speaker on the phone seems to have more oomph than the one on the Z10. While the display is certainly worth talking about (and we shall, in just a moment), given the internal similarities with the Z10, the highlight of the Q10 is surely its keyboard. Thankfully, it's a very good one -- but we're not entirely sure we'd call it better than that on the Bold 9900. The biggest distinguishing feature is the keyboard layout, which does away with the ergonomic, curved shape in favor of straight rows. While this does mean you may need to move your wrists closer together to achieve proper thumb alignment with the keys, you're not likely to notice much of a difference. Otherwise, the layout is almost exactly the same, with the only slight difference being the addition of an alternate function on the 0 key: a little microphone. It's with this that you trigger BlackBerry 10's Voice Control feature, though in general we'd much rather just type. And, thankfully, you can. You can just start typing from the phone's home screen to search for apps or contacts. You can also enter in commands, like "email" to start an email or "bbm" to send a message. This is a very handy extension to the OS that can certainly speed up simple tasks. Overall key shape is the same as on the earlier Bold, with that same gentle arc of the keys curving to meet your thumbs. It is, then, very nearly the same as you've experienced on earlier BlackBerries, and that is, of course, a very good thing. That said, we couldn't help but wonder how this device compares to typing on the new, predictive keyboard on the Z10. So, we compared them. The move to physical keys defeats some of the most compelling aspects of BlackBerry 10's predictive virtual keyboard, namely the ability to flick upward on individual letters to auto-complete words and the ability to swipe from right to left to delete a whole word. There is a predictive mode you can enable on the Q10, which simply places a row of suggestions along the bottom of the display as you type. We found reaching up to it and then back to the keyboard a bit clumsy and, indeed, it's disabled by default. In nearly every situation, we were quicker entering text on the virtual keys of the Z10 than the physical ones of the Q10. Even though the predictive modes on both the Q10 and the Z10 quickly figured out our primary testing phrase ("the quick brown fox...") we were still slightly faster on the Z10. In fact, in nearly every situation we tried, we were quicker entering text on the virtual keys of the Z10 than the physical ones of the Q10. The exception? Email addresses and passwords. Getting to special characters is far less cumbersome when they're all right there on the keys. It isn't too often you see a square display on a smartphone these days, but then again portrait-QWERTY devices are hardly a dime a dozen either. The panel in the Q10 is a 3.1-inch, 720 x 720 Super AMOLED that, we're happy to report, looks quite good from all angles -- though, it must be said, the color temperature goes from overly warm to cool when you look at it off-angle. Even so, contrast remains quite high. Brightness is also good and the panel is easily visible in direct sunlight. It's really the size and the shape that are its only detractions. The 3.1-inch display is about 10 percent larger than the 2.8-inch LCD on the Bold 9900, and that we've moved up to 720 x 720 from VGA definitely helps too, but the panel here certainly looks and feels tiny compared to the relatively mammoth displays found on other smartphones. That includes the 4.2-inch, 1,280 x 768 LCD on the Z10, by the way, which feels far better-suited for consuming content, surfing the internet and even cruising through long lists of emails and other social missives. Of course, that phone doesn't have a keyboard. On the Q10, we have the same pair of cameras as we found on the Z10 -- that is, a 2-megapixel shooter in the front and an 8-megapixel unit in the back, paired with an LED flash. Unsurprisingly, then, we found camera performance in the Q10 to be just the same as on the Z. In bright light, photos are passably good, lacking sharpness and having a bit of noise, but color reproduction is solid. Low-light shooting is something we would avoid. Skies seemed to actually have their contrasts decreased when HDR was enabled. That is, unless you enable the new HDR mode that comes along as part of the BlackBerry 10.1 OS update. In this mode, the camera will take two shots at different exposures and average the two together. It will, thankfully, save two shots to camera storage: a normal one and one "enhanced" by the HDR. In almost every circumstance we liked the non-HDR photo better. While dark colors did indeed get richer with HDR enabled, anything that was already well-lit seemed to actually get duller. Disappointingly, skies in particular seemed to actually have their contrasts decreased when HDR was enabled. Finally, as on other platforms, make sure you're only photographing stationary subjects when using HDR. Otherwise you run the risk of introducing some spooky ghosts into your images. Maximum video recording is 1080p out of the rear camera, and quality is reasonable. Video can be digitally stabilized here, but as you can see in the sample footage above, enabling it actually introduces some rather distracting jiggling to the mix. We're not entirely sure that's actually better than the shake it aims to replace. The camera is reasonably quick to re-focus while filming, but we did notice a bit of focus-hunting when shooting at more distant targets. We reviewed the QNX-based BlackBerry 10 quite comprehensively when it released, so we won't cover much of the same ground here, but it is important to note that the Q10 is actually running version 10.1, an update that won't come to the Z10 for a few weeks at least. While there are no major changes, there have been a few tweaks we should mention. Again, the main feature of BlackBerry 10 is easy multitasking, primarily facilitated by gestures. Swiping up from the bottom bezel of the phone drops you back to your running apps and, as mentioned above, that's actually a bit of a challenge given the proximity of the keyboard to the display. Swipe up and to the right and you get to the BlackBerry Hub, which consumes all your messages from email, Twitter, Facebook, LinkedIn, BBM and elsewhere into one massive, fast-flowing pile. Color schemes have been made darker in many apps, helping to boost the battery life on this OLED panel. With 10.1, you can now download email attachments, a rather necessary feature missing in the initial release, and send pin-to-pin messages in BBM. You can also now paste phone numbers into the dialer and take HDR photos, if you're so inclined. Specifically for the Q10, color schemes have been made darker in many apps, helping to boost the battery life on this OLED panel, and many on-screen controls have been shrunk or removed entirely to make the most of the 3.1 inches on offer here. The biggest change is the addition of Instant Actions, mentioned above, which enables you to type something like "email bob" to send an email to Bob. Other available commands include "text," "bbm" and "call." What's not changed? Most everything else, including, most tragically, the navigation app. It's still far too limited to be taken seriously when compared to the mapping offerings from Microsoft, Google or Apple. Similarly, the app selection in BlackBerry World hasn't changed substantially in the past few months since the release of the Z10, leaving it hurting when compared to those other platforms. Indeed, overall improvements are slight and the Q10 works and feels very much like its predecessor. While the OS is very quick and responsive and the browser is as well, 3D gaming is not this phone's forte. The Need for Speed game that came pre-loaded on our review unit often stuttered and struggled, and if the pack-in game isn't working well, that's not a good sign. For your more casual mobile gaming pursuits, the Q10 will do just fine. 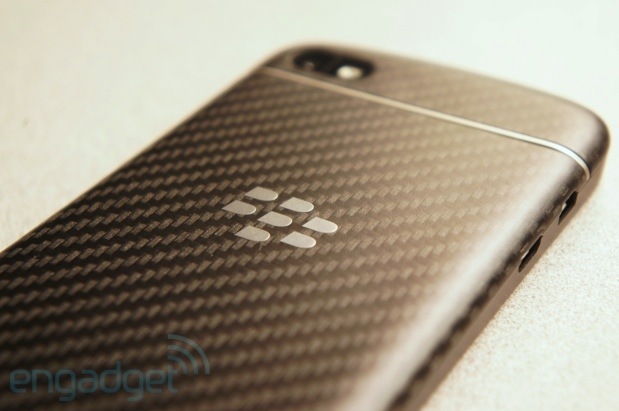 The Q10 will also do just fine lasting through a day of usage, we found. On our standard battery rundown test, which entails a video looping endlessly while the phone is connected to LTE and with the display on and set to a fixed brightness, the phone managed nine hours and 35 minutes total. That's an hour and 20 minutes more than the Z10 before it, putting it more or less on-par with the LTE Samsung Galaxy S III. More importantly, we easily got through a full day of typically heavy use without reaching for the charger. That said, the 2,100mAh battery pack here is slender enough that carrying a second around won't take up too much space in your satchel. Finally, boot-up times are still as painfully slow as on the Z10. The phone took one minute and 20 seconds to cold boot and a full 22 seconds just to completely shut down. That'll be a definite pain point for battery-swappers. The BlackBerry Q10 is, for the most part, exactly what we expected it to be: a Z10 with a smaller display and a physical keyboard. There's not much between the two phones when it comes to performance or aesthetics and, while the improvement in battery life is nice, both still fall into the "average" category in that regard. Unsurprisingly, then, which of the two is right for you boils down to a single question: how badly do you hate typing on glass? Again, our testing found text entry to be faster on the Z10 than the Q10 in most situations, but speed doesn't always equate to satisfaction. All things being equal, we'd prefer a physical keyboard to peck at than a piece of glass to smudge, but here we'd choose the Z10 just for that larger display. And what of the broader question, of whether the $249 Q10 can help BlackBerry get its groove back and compete with the rest? There are certainly those who won't buy a phone without a keyboard, and the Q10 is unquestionably the best phone with a keyboard on the market. However, given how weak the competition and demand there has become, we're not sure cornering that market will move the needle very far in BlackBerry's favor.